Living in the US, we are faced with a healthcare system that is privatized and confusing, while often reliant on insurance companies to help us with the monetary aspects of our care. This position, however, can often leave individuals with unanswered questions, economic tradeoffs, and financial fragility. Memorial Sloan Kettering (MSK) is a premiere cancer hospital and research institution in the US. 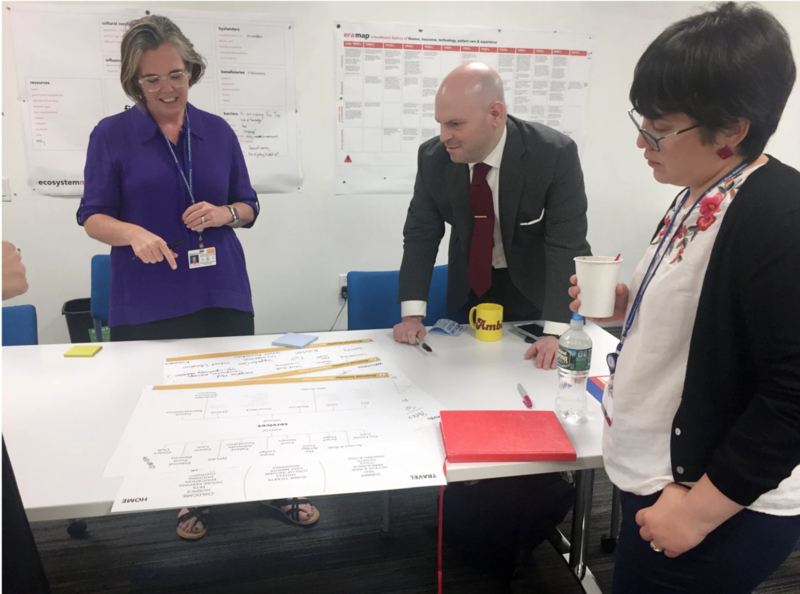 Within the hospital is a team called the Design Impact Group, which works to use Human Centered Design to aid the hospital in new services, strategies, and products focused around patients and staff. 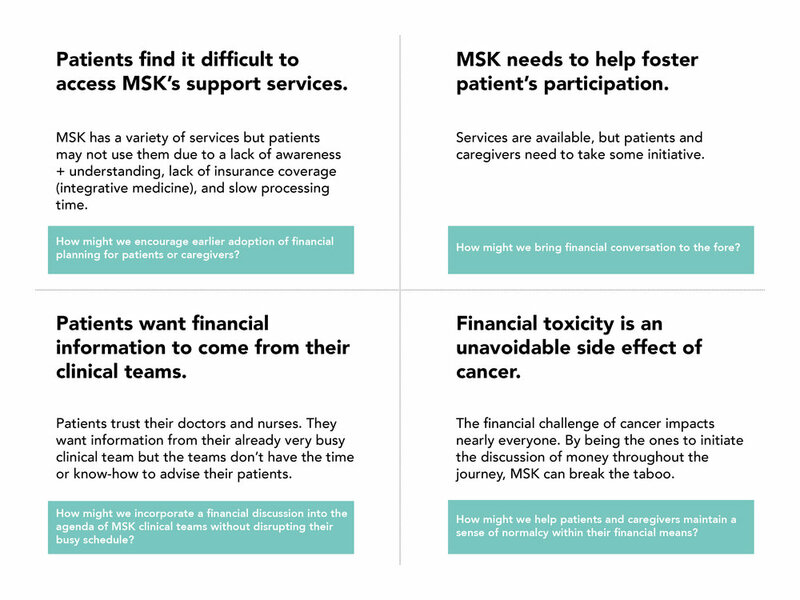 MSK was interested in understanding the role of financial toxicity on their community. They paired our fellowship with the Immigrant Health and Cancer Disparities Service to begin to research into the impact that finances have on patients, before, during, and after treatment. We started our research looking at scientific studies on finances in health and cancer care. We reinforced this information with studies on Z and related financial stressors, including student loans and bankruptcy. 44% of subjects found talking about finances the hardest conversation to have, compared to 38% around death. Clinical Shadowing - The team collectively completed 7 clinical rotations with the breast, urology, and radiation oncology units, shadowing doctors as they worked with patients to convey their current physical situation, as well as discuss the range of topics surrounding it. Shadowing gave us insight into patient-doctor relationships, timing, and information shared during appointments. Cancer Hospital Food Banks - Working with the Immigrant Health team, we observed multiple food banks across the city, including one at MSK, that caters to lower income cancer patients. This allowed us to gather information on demographics and the role food plays in cancer treatment. We conducted 31 interviews from a range of stakeholders, including patients, doctors, MSK financial staff, researchers, and patient advocates. We used a variety of tools to prompt deeper reflection, including card sorts and a timeline of their financial life in regards to treatment. 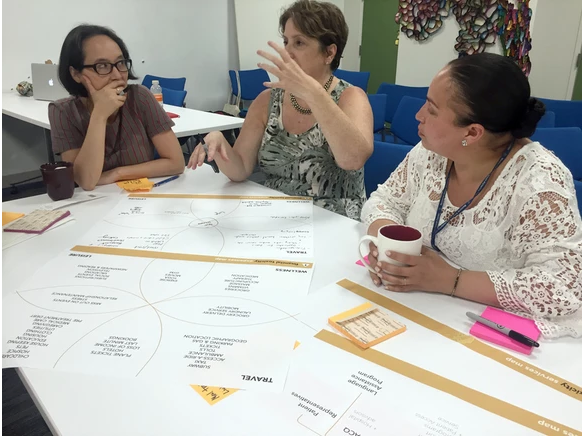 We ran a multi-stakeholder workshops with the DIG team, caregivers, MSK staff, and patients, using two maps on services and everyday activities. Participants were asked to discuss, edit, and highlight key tension points through a co-creative process. After our research, we synthesized everything we had heard, pulling out key quotes and distilling patient timelines into an average journey map. From here, we identified our key insights, which you can read below.